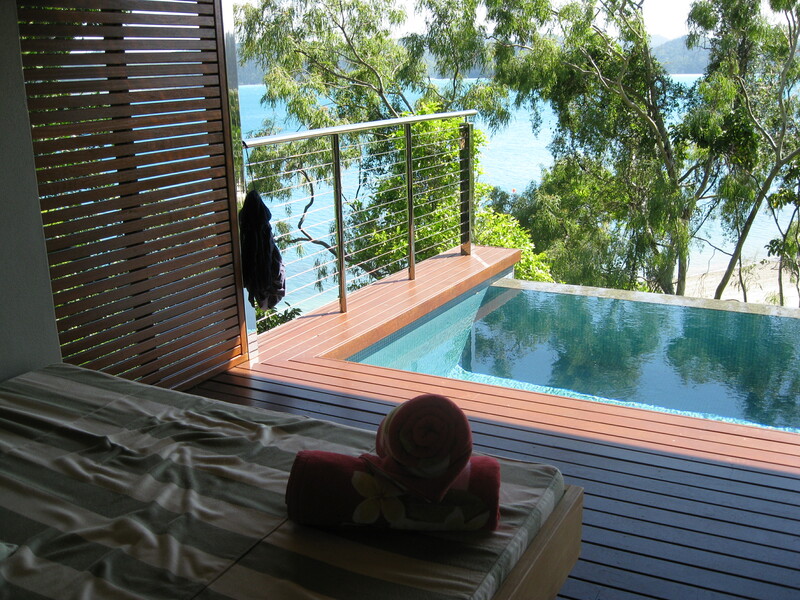 We’re leaving qualia. We’ve taken a final plunge in the infinity pool, enjoyed the views from our verandah for the last time and said goodbye to our pavilion. The qualia coach makes its way slowly through the gardens, under the eucalyptus and the palms, past the hibiscus, azaleas and the lush green lawn. The tall gates swing open, we glide through and they close behind us. We’re back in the real world, heading back to our real lives. I‘m leaving qualia without regrets. I’m looking forward wholeheartedly to home, the family, my own cooking, work, my own gym and even in a funny kind of way to mundane household tasks. I feel fantastic; I’m relaxed, rested, refreshed, rejuvenated and my jaded sensory imagination has been re-fired. But I’ve had enough of qualia and this I suspect is really the point and purpose of the place. Qualia is a retreat and a refuge from the outside world, a lovely, peaceful place where everything is beautiful, luxurious, harmonious carefree and delicious. There is no discordant note, no discomfort, no ugliness and no care. It’s wonderful. It’s paradise. But mere mortals cannot live for long in paradise, especially when there is bread to be won by the sweat of the brow on earth. They can, however, if they’re lucky take a little restorative break in paradise when it all becomes too much out there. That’s where qualia comes in.